Hug-n-Cuddle Elephant Activity Gym is rated 4.4 out of 5 by 25. This sweet elephant will give your baby a jumbo-sized hug with every playtime snuggle. 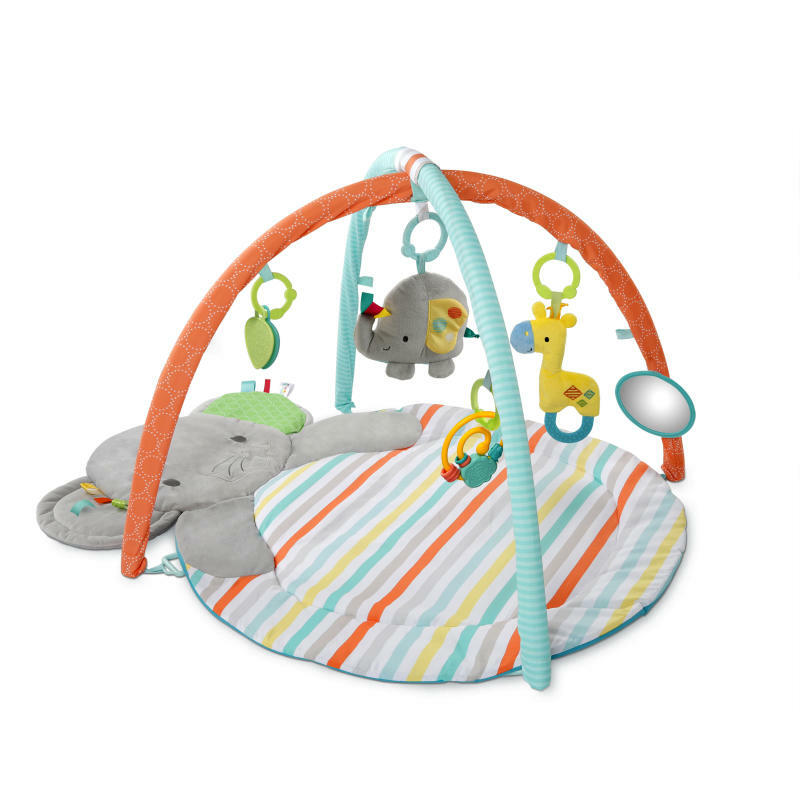 The Bright Starts Hug-N-Cuddle Elephant Activity Gym creates the comfiest and coziest space for tummy time or lay-and-play fun. Lay alongside your little one as he stares up at the dangling toys above. During tummy time, he’ll love to tug on the satin Taggies that line the elephant’s ears. In any play position, your little one will have a blast shaking, rattling and squeezing the 5 take-along toys included. As baby gets bigger, you can remove the toy bar and transform the elephant into a cushy play mat and soft, cuddle-worthy friend. This plush activity gym will give you and baby plenty of room to snuggle for years to come. Dimension (in) 36" x 24.5" x 19"
Rated 1 out of 5 by Pottersquash from Cute. Poor Support As with all the reviews who got the product for free, I agree that it’s cute and kiddo likes it. The problem is the melody producing elephant. It says it can be set to parent activated or baby activated by I can’t yell how either activates it and there is no information anywhere to assist. That would be fine if the on/off were on the outside of the elephant but that would be too much like right I guess so it’s inside. So to turn on the melody, you have to open up the elephant every time. That’s annoying and given the 15 melody is the big selling/differing point, one star. Rated 1 out of 5 by Pottersquash from Cute. Poor Support As with all the reviews who got the product for free, I agree that it's cute and kiddo likes it. The problem is the melody producing elephant. It says it can be set to parent activated or baby activated by I can't yell how either activates it and there is no information anywhere to assist. That would be fine if the on/off were on the outside of the elephant but that would be too much like right I guess so it's inside. So to turn on the melody, you have to open up the elephant every time. That's annoying and given the 15 melody is the big selling/differing point, one star. Rated 5 out of 5 by Valencya from Wonderful playmat This playmat makes for wonderful tummy time for my infant! Rated 3 out of 5 by Boymomatl from Compact and cute This was a great option to use in a smaller space as it did not take up a lot of room like some of the larger activity mats. My little guy quickly outgrew it however and there wasn't a lot to keep his attention span. Good value but perhaps better suited for a grandparents house and not as the primary activity gym :). Rated 5 out of 5 by Bird268 from Great colors! These things get so dirty that it's awesome to have a new one with a new baby! We love the colors and the elephant. It's nicely padded, but not unsafe for tummy time. Get toys to catch her eye! Rated 5 out of 5 by Appyjumper from Awesome Play Mat This mat has so many features to entertain little ones! It's also super plush and I love that it can be used in a variety of options that grow with baby, not just a basic play mat.